Please enter the name you want on the puzzle. What's a puzzle without your name on it? Both fun and educational with our new personalized puzzle. Designed with skillful craftsmanship for children. 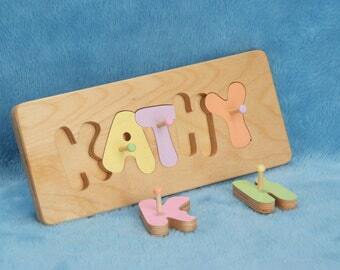 A perfect tool to help teach children to spell their name. Also aids and promotes manual dexterity! It can be first, middle and last name or anything you would like. Names longer than 7 letters will be reduced to fit on board. 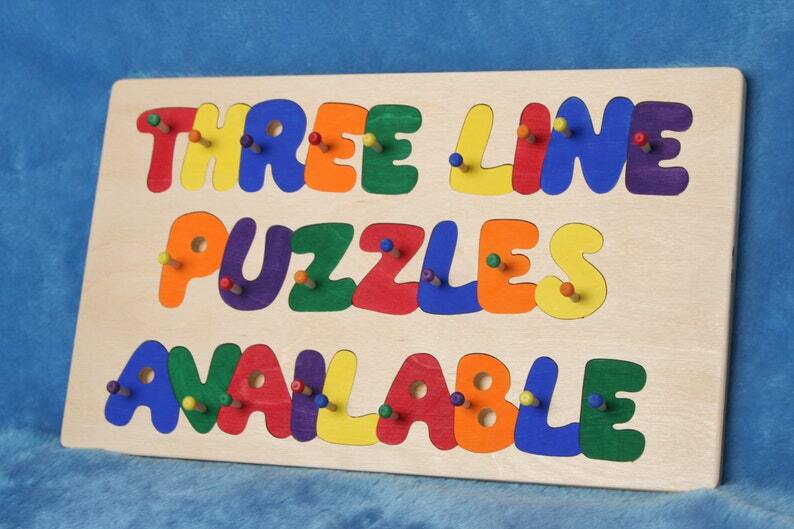 Each letter of the Puzzle Board is brightly painted with safe, non-toxic paint, in your choice of primary or pastel colors. Rounded edges & corners. Sturdy, handcrafted construction and sanded to a smooth finish with a child safe finish. Makes a delightful gift for birthdays, holidays and special occasions. Please indicate the name on the puzzle or what you would like each line on the puzzle to read. The colors that you want the letters, Pastel or Primary when placing your order. NOTE: The pegs make it easier to get the puzzle pieces out. These Puzzles are not recommended for children under the age of three. CRAFTED WITH PRIDE IN THE U.S.A.
Great job! I wish the shop would have been able to customize the colors a bit more but overall these are awesome. Fast shipping, perfect puzzle. My two-year-old has done it 100 times already! I'm ordering one for my niece right now!